This page contains pictures and information about Orange Black Stink Bugs that we found in the Brisbane area, Queensland, Australia. We found this bug once during mid summer in Karawatha Forest 2005. It was wandering on grasses. 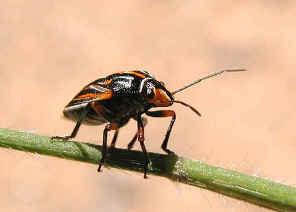 The small bug has the eye-catching colour patterns, with orange and white strips on black. We checked that there is not much information available about this Orange Black Stink Bug. 3. Novatilla virgata (Dallas, 1851) - Australian Biological Resources Study, Department of the Environment and Heritage, Australia 2005.